Summary: Satan has already tried to attack God’s position in heaven and failed, so now he is about to try attacking God’s plan on earth. Chapter 13 describes in great detail the reign of anti-Christ up to his eventual doom at Armageddon. There’s only 31/2 years left before Messiah come with His saints – that’s you and I! In this chapter there seems to be an interlude taking place - all is quite on the Jerusalem front with false peace and false security. Satan has already tried to attack God’s position in heaven and failed, so now he is about to try attacking God’s plan on earth. Chapter 13 describes in great detail the reign of anti-Christ up to his eventual doom at Armageddon. Will he be celibate or a homosexual? But one thing we do know – just as Jesus is the offspring of the seed of woman in Genesis 3:15, the anti-Christ will be the offspring of Satan! As Christ is the “Good Shepherd”, the anti-Christ will be the “Evil Shepherd” of Zechariah 11:16. Just as Christ is the “Son of God, the anti-Christ will be the “Son of Perdition” of 2 Thessalonians 2:3. And just as Christ is the one who “fulfills the law”, the anti-Christ will be the “Lawless One” of 2 Thessalonians 2:8. “Sands of the sea” = this already tells you that he is on shaky ground and sifting sands! Today we can choose to build our lives on Satan’s Rubble or God’s Rock! “A beast rising out of the sea”= sea represents people or nations of the world, as in 17:15. Some scholars think that this represents the Mediterranean area and that the anti–Christ will come from the region of the world. “Seven heads” = 7 successive world empires with kings: Egypt, Assyria, Babylon, Medo-Persia, Greece, Rome and the final kingdom of the Anti-Christ’s. 7 is the number for completion. 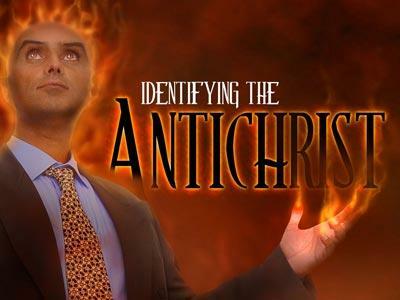 In chapter 17:10, there were only 2 kingdoms left to finish out this prophecy – Rome and the anti-Christ’s!!! “10 horns with 10 toes” = 10 kings or rulers that are sub-rulers under the anti-Christ. These are the 10 toes of Daniel 2! Each had a blasphemous name on its head. As the Anti-Christ will be the ringleader, he will lead the world into complete rebellion against God. What does this mean? Possible he has gone complete pagan and lost any religious teaching given him. Some think that this means that the anti-Christ will be Jewish! I don’t. - Leopard, bear and lion = describes how majestic, swift and powerful his rule will be. All of this power wrapped up in satanic possession! Only 2 people are ever mentioned in the Bible as possessed by Satan himself – Judas and the anti-Christ. “One of his heads wounded” = it could refer to one of his kingdoms destroyed and revived or the anti-Christ will be wounded and will fake his resurrection. At this point in the tribulation and his reign, the anti-Christ will successfully rule the unbelievers, but will only be able to intimidate the believers! His great threat will be against Christians. At this stage of the tribulation it will be a horrible place for Christians. Satan has already tried to attack God’s position in heaven and failed, so now he is about to try attacking God’s plan on earth. Chapter 13 describes in great detail the reign of anti-Christ up to his eventual doom at Armageddon.